Eurostyle Inward Opening windows Tilt & Turn­ IV78 profile – alu­clad timber windows for customers who value high thermal insulation and exceptional durability. Alu­cladding protects a window against harsh weather and gives it a modern look. Inward opening windows may also be titled which makes cleaning and maintaining of a window easier. IV78 profile is characterized by high thermal insulation. It also provides outstanding protection against moisture. Window frames are usually manufactured from such timber species as: oak, pine and meranti. Timber comes from FSC­certified suppliers. FSC certification guarantees that timber comes from well managed forests. The timber we use is 80­100 years old. Outer frame is covered with aluminum which provides better protection against external factors. Not only does the cladding protect the frame, but it also provides better thermal insulation of a window unit. 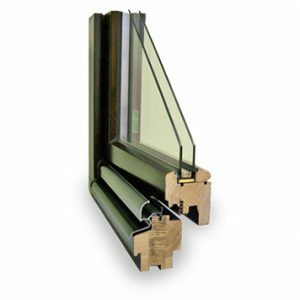 Alu­clad timber windows are a perfect choice for modern buildings. We use GU and ROTO hardware. The type of fittings is chosen individually for every project. We also offer one­way mirrors and other types of custom made glass. Every window has an aluminum spacer bar which can be replaced with a warm spacer bar to increase thermal insulation. Frames are available in a wide range of RAL colours. We use opaque and translucent Teknos Gori paints due to their durability and resistance to fading. There is a possibility of designing dual colour window frames. Aluminum cladding is available in a wide range of RAL colours. The most common decorative elements are glazing bars.